Enter The NEW Unplugged 99.7 KYUU Radio Forum! 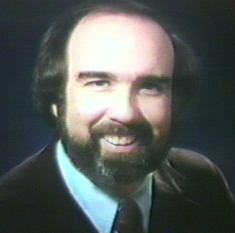 EDITOR'S NOTE: It brings me great sadness to report that KYUU midday extraordinaire (and most recently K-101 midday host) Rick Shaw passed away en route to the hospital early in the morning of June 22, 1998 at the age of 53 -- too soon to leave this world. I had the pleasure of working with Rick for six years and will always carry fond memories of his gentle nature, his quirky sense of humor and his fondness of model trains and flying. Some great stories of Rick are contained in the pages herein. Rest in peace, Rick. San Francisco radio will never be the same without you. Additionally, Rock 'n Roll Heaven just inherited a terrific PD for its radio station. 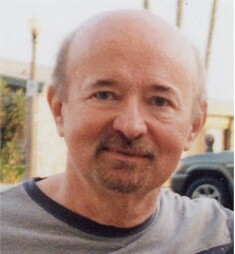 Mike Phillips, the original Program Director of KYUU, succumbed to a lengthy battle against pancreatic cancer at the age of 64, on October 16th, 2006. Mike left a great many friends and admirers from his many years in the business and his sense of humor will be sorely missed by those who knew him best... I will remain personally grateful for the hand Mike extended to me in 1991 when he hired me for a brief stint at K-EARTH 101, while I was going through a particularly rough patch in my radio career. God bless, and thanks, Mike. Our deepest condolences to all of Mike Phillips family members and many, many friends. Funny how these things come about. Some guy named Alex was perusing the Internet from his casa in Spain, looking for KYUU jingles of all things! He found my main home page in a directory and learned of my connection to KYUU. 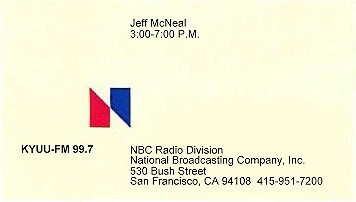 During my six year stint doing PM Drive at the San Francisco NBC O&O, I received a reel of TM jingles that Mike Novak had commissioned when he was Program Director, sometime around late '82 or early '83. A year or two after Novak's departure, Program Director Ric Lippincott was cleaning off his shelf and was about to throw the jingle reel into the trash, since he had new jingles produced. I asked if I could have the reel and it's been sitting in a box in my garage ever since. Along with my old business cards. Nice, huh? I figured as long as I was going through the trouble of mixing the jingles down into large .WAV files for the guy in Spain, I might as well throw in a few other tidbits as well. Click on my billboard (circa 1986, see Airstaff page in index below) to hear my jock jingle. More sounds and airchecks from my years at KYUU can be found on my Broadcast Biography page. Wherever possible, I will provide links to the home pages or email of other former KYUU staff as I become aware of them. Listen: If you have anything you'd like to add to this page, including old KYUU airchecks, promotional literature, photo's, other graphics etc., Email me and I'll post them, if appropriate. Whether or not you agree that a now-defunct station like KYUU is worthy of a web page is irrelevent. To the people that listened to it, or took part in its evolution, KYUU left a lasting impression. One caveat to bear in mind is that you will be viewing the station from my perspective, naturally. For better or worse, I'll try to state for the record the way the station really was, but again, any opinions expressed are just that. I'll rely on former staffers to fill in the blanks -- such as the actual start-up of the station, since I wasn't on-board until September, 1982. The station had changed to a bolder CHR music mix from the original A/C mix that started the format. Walter Sabo has been kind enough to describe the original launch of KYUU in his own words. Click here to read about the birth of KYUU.